• Where is the dam? 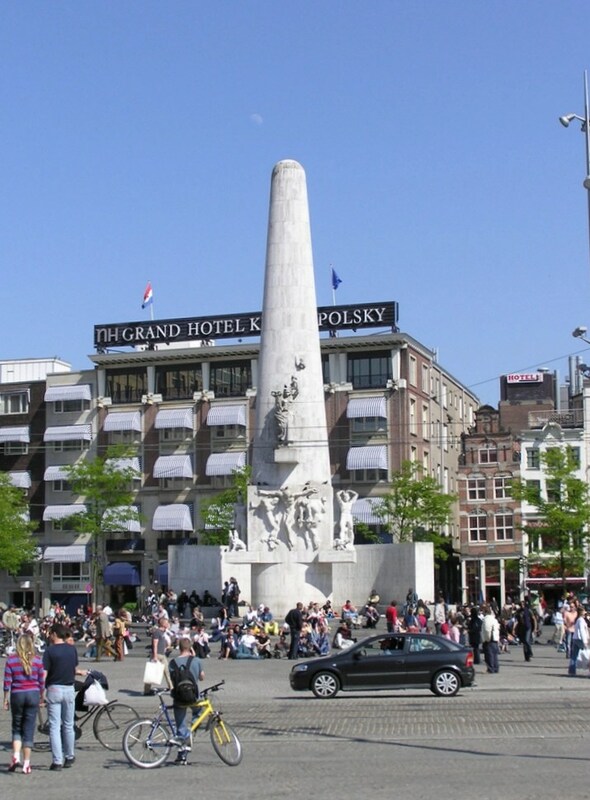 As the site of the Royal Palace, Dam square often is the focus of events of national importance — as in the annual Remembrance Day (May 4) ceremonies which take place at the National Monument, commemorating those who died during the Second World War. Several times a year the square is the site of a funfair. From time to time there are other events as well, such as concerts, sports events or a used-books market. Usually the square is home to a number of living statues and other buskers. At times protests are organized here. Many people feel that Dam Square itself doesn’t have the allure and ambience of other big city squares. A relatively recent redesign hasn’t helped much either. The square’s distinctive cobblestones were discarded and replaced by, well, other distinctive cobblestones that have turned the place into a challenge for, among others, those who wear high heels. The street furniture is uninspired and out of touch with the general setting. The square could do with a fountain or two, perhaps, and certainly with some color: a lot more trees, for instance. And while we’re at it, some establishments where something to eat and drink doesn’t cost an arm and a leg. And yet, miss Dam Square and you haven’t really seen Amsterdam. The Dam is the city’s beating heart. This 15th century gothic building is the site of Royal coronations and weddings, as well as art exhibitions, but not of church services. Erected in 1956 to memorialize the victims of World War II. Visitors often marvel at the fact that people are allowed to sit all around the monument, but the Dutch government says that’s simply a reflection of the freedom we enjoy. In our opinion visiting this branch of the famous wax museum is one of those things not to do in Amsterdam. It’s expensive and often quite crowded. If you do go, you’ll enjoy a great panoramic view of Dam Square and Damrak from the round picture window at the top floor. What these buildings have in common is that they are ugly, especially since they are totally out of context with neighbouring buildings. In our opinion people who design these type of projects in those kind of settings, and the people who allow them to be built, hate Amsterdam. In front of the palace, close to the New Church, you’ll often find a number of horse-drawn carriages. There is a choice of tours: through the Old City, along the Canals, through the Red Light District or the Jordaan neighborhood. Hotels in the city center can also order a carriage to be used instead of a taxi. Expect to pay anywhere from €35 for a 20 minute tour, to €85 for 60 minutes (maximum of 4 people per carriage). Street evangelists representing different denominations — and sometimes religious cults — like Dam square. At times Christians sporting ‘Free prayers’ jackets offer just that: a free prayer. A mission organization has been known to perform drama skits with an evangelistic theme. For some reason tourists like their European squares to be overrun by pigeons. Oblivious to the nuisance the disease-ridden animals represent, many visitors feel obliged to be photographed while feeding them. The city, meanwhile, actively tries to reduce the pigeon population. Among the approaches: sterilizing them via genetically-modified food, replacing their eggs with fake ones, and stationing a hawk on top of one of the buildings at the square. So please… don’t feed the pigeons. 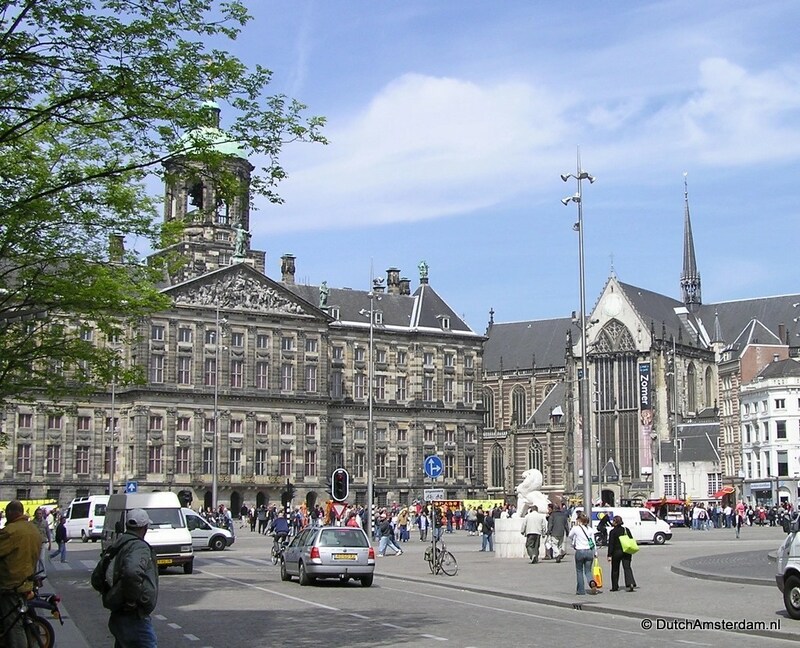 Most tourist guides claim that Dam Square is the spot where Amsterdam was first settled, and where the city got its name: a dam in the river Amstel. However, that is not quite true. To understand why not, read Was Amsterdam named after a dam in the river Amstel? (The article includes an annotated, 1544 map of Amsterdam). As noted in that article at one time there was indeed a dam at what is now Dam Square. But don’t bother looking for it today. You won’t find it as it hasn’t been there for centuries. The dam — a wide bridge with wooden doors to stem the flow of water during high tide — was located roughly between where you currently see the National Monument and the busy Damrak/Rokin thoroughfare. However, deep beneath the cobblestones there is a culvert through which water from the river Amstel still flows from Rokin to the remaining cul-de-sac of water at Damrak near Central Station. Peek & Cloppenburg is a German company that has grown into an international brand with fashion department stores in several countries. Madame Tussauds is located in a corner of the imposing building. The building, in the neo-Classical style, was opened on April 17, 1916. At the time it was viewed by many as a “dull and lifeless structure,” but it is now listed as a national monument. Locals long referred to the store as the ‘Trouser Palace.’ The building sports 14 gable stones that are reminders of the houses and businesses that used to be at this location prior to the contruction of the P&C building. Operated by Swedish fashion chain Hennes & Mauritz, which recently opened its Amsterdam flagship store in this historic building formerly occupied by the ABN-Amro bank. Originally this location housed several buildings that over time were combined and reconstructed a number of times. The buildings, which through the years have served several functions, have now again been reconstructed. The facade has been renovated and the original turret at the corner of Dam Square and Nieuwendijk has been restored. ABN Amro still has a presence at the Damrak corner of the building, while H&M occupies the rest. © Copyright DutchAmsterdam.nl. Want to use this photo? 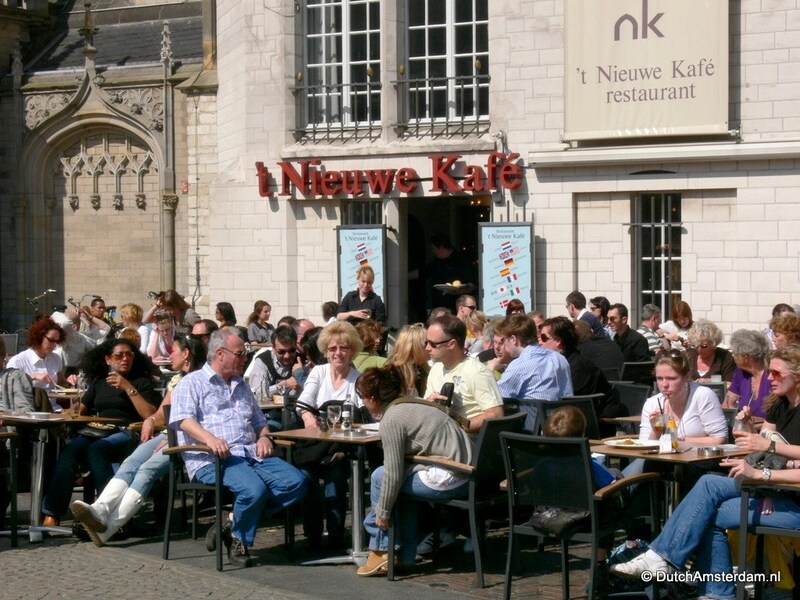 You could also pop into the Nieuwendijk shopping street (between the New Church and Damrak) where, after just a few steps, you’ll find a number of fast-food places including McDonald’s, Burger King, a pizza place and the Dutch favorite, Febo. Bijenkorf Kitchen — inside the Bijenkorf warehouse, at the top floor. Dam Square is reached from Central Station via Damrak — the gaudy main drag which the City would like to turn into a red carpet of sorts. It’s a 5-10 minute walk. Alternatively you can take trams 4, 9, 16, 24, or 25 and exit at the first stop, across from the Bijenkorf warehouse. Across from Dam square Damrak turns into Rokin, the main thoroughfare between Dam and Munt square. If you prefer you can saunter toward the Dam via the Nieuwendijk shopping street which feeds into Dam Square in front of the palace. Across the square from Nieuwendijk the shopping street continues as Kalverstraat, which runs between the Dam and Munt square. If you are coming from — or going to Munt square — you can also take Rokin. Rokin features stores, some pubs, a some very nice buildings as well. — © Copyright DutchAmsterdam.nl. Do not republish or repost.